2001 was my first year chasing. Most of it was done as a guest with Silver Lining Tours. On the second day of the tour, we chased my first supercell between the towns of Mankato and New Ulm, Minnesota, and the next day chased my first real monster of a storm near Carroll, Iowa. We didn't see all that much for the rest of the tour, but I was hooked. I loved being out on the plains, and the science of tornado forecasting. On returning home I decided I needed to get meteorology into my career and went back to school and got my masters degree in atmospheric science. Truly a life changing experience. May 8th-May 17th, 2001 Photo Album with Captions. 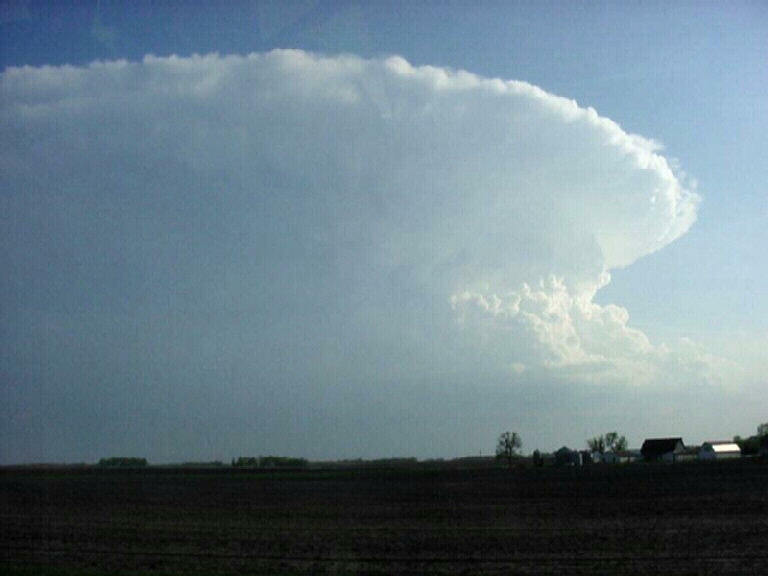 May 9, 2001: Nicely structured classic supercell between New Ulm and Mankato, MN. May 10, 2001: A long chase day starting with a classic supercell near Carroll, IA and ending with an HP monster near Ames, IA. May 16, 2001: Large isolated supercell near Beatrice, NE with a large "collar" wall cloud. July 12, 2001: A local chase! Nice little severe thunderstorm in Bedford, MA, not far from my home.